"Canned pineapple is harvested and packed at its peak of ripeness, making the can one of the best ways to deliver the fruit from its source to your table." Meanwhile, sprinkle chicken with jerk seasoning. In 12-inch skillet over medium-high heat, in hot oil, cook chicken pieces until browned on all sides, about 5 minutes. With slotted spoon, remove chicken to plate. In drippings remaining in skillet over medium heat, cook onion, about 5 minutes. Add chicken pieces, pineapple chunks, black beans, green chilies and jerk marinade. Over high heat, heat to boiling; reduce heat to low. Cover and simmer 8 to 10 minutes until chicken is tender, stirring occasionally. 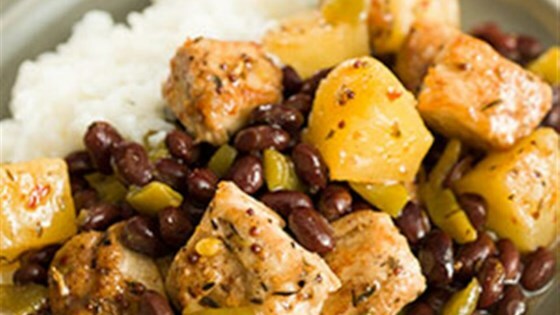 Serve jerk chicken mixture over rice. This was delicious. In order to reduce the heat, I used 1/8 cup of jerk marinade and 3/8 cup of teriyaki marinade. Next time I would add some broccoli or bok Choy for a one dish dinner. I liked it a lot, but I got mixed reviews from my family. I think the ratio of beans to chicken was slightly off, so the consistency felt more like a chili.